This is the standard folder type. 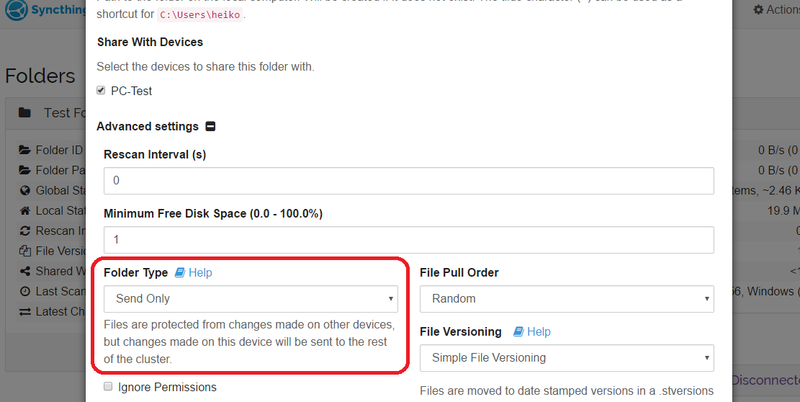 Under this setting, a folder will both send changes to and receive changes from remote devices. A folder can be set in “send only mode” among the folder settings. The intention is for this to be used on devices where a “master copy” of files are kept - where the files are not expected to be changed on other devices or where such changes would be undesirable. In send only mode, all changes from other devices in the cluster are ignored. 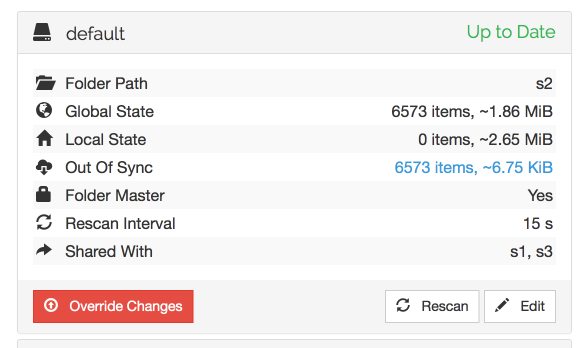 Changes are still received so the folder may become “out of sync”, but no changes will be applied. When a send only folder becomes out of sync, a red “Override Changes” button is shown at the bottom of the folder details. Clicking this button will enforce this host’s current state on the rest of the cluster. Any changes made to files will be overwritten by the version on this host, any files that don’t exist on this host will be deleted, and so on. The receive only folder is the logical opposite of the send only folder. In this mode, all changes from the cluster are applied, as they are in the default send-receive mode. Local changes are however not distributed to other devices. This mode is useful for replication targets, backup destinations, or other cases where no local modifications are expected or allowed. Much like a send-receive folder, any local modifications are preserved and do not cause the folder to become “out of sync”. The device will however look out of sync on other devices, as it does no longer have the latest/expected version of the modified file. When local changes have been detected Syncthing will show a red “Revert Changes” button on the folder. Activating this will cause the local modifications to be undone - added files will be deleted, modified or deleted files will be re-synced from the cluster. In normal operation, a locally modified file that is subsequently modified by the cluster will cause a sync conflict. The conflict will be resolved with the cluster version as the winner. Being a receive-only folder, the sync conflict copy will not be sent to the cluster - and will be deleted if “Revert Changes” is used.